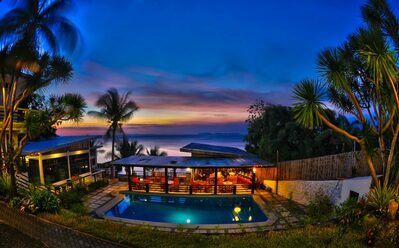 A stay at Halo Anilao Dive Resort is not your typical Anilao experience. Being best suited for couples and families, you will avoid the throngs and enjoy the opportunity to relax and take in the breathtaking beauty around you. Whether it is scuba diving, snorkeling, or simply soaking up some of Anilao's famous sun; the highest quality experiences are at your fingertips here at The Halo Anilao Dive Resort. 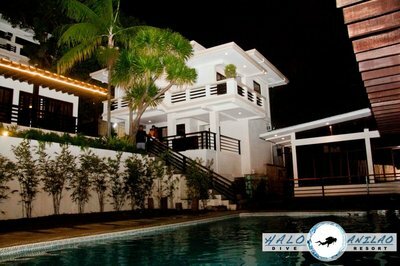 Halo Anilao Dive Resort Dive Resort Packages - there are a number of packages available which include accommodation and diving at Halo Anilao Dive Resort. You can skip straight over to our Halo Anilao Dive Resort Dive Packages page for more details on these services. The diversity found throughout the house reef and nearby dive spots itself is astounding. Within the area are at least dozens of different habitat types including montane and mixed-monsoon forests, coral reefs and coral islands. World-class resort facilities in a truly out-of-the-way location are what make The Halo Anilao Dive Resort such a unique experience. In addition to the fantastic scuba diving in Halo Anilao Dive Resort, the resort boasts it's own dining area, three types of accommodation, various lounge areas, swimming pool and the air of seclusion and privacy in paradise.